Statewide, about 27,300 homes could be flooded if sea levels rise six feet, including one-fifth of homes in Grays Harbor County. Update, Oct. 26: The original story, about Zillow’s analysis of local homes that could flood if sea levels rise at least six feet, said the study did not take into account whether the Ballard Locks could help prevent flooding of homes along Lake Union and Lake Washington. The U.S. Army Corps of Engineers, which operates the locks, says Puget Sound waters would need to rise at least 6.6 feet for properties on Lake Union and Lake Washington to potentially flood. That’s seven to eight inches higher than the six-foot water level rise included in Zillow’s analysis, which used government forecasts on potential sea level rise through 2100. Zillow initially said 5,042 Seattle-area homes could be in danger of flooding if sea levels rise six feet – about 1 in every 200 homes across the region. But about 1,010 of those homes are along the lakefront and would not be in danger of flooding unless sea levels rise at least 6.6 feet, the Corps of Engineers says. The headline of this post has been updated to remove a reference to “1 in every 200” homes being in danger. When it comes to rising sea levels flooding parts of the country in the future, you might think of places like Miami and New Orleans — but Seattle could be susceptible, too, albeit on a much smaller scale. 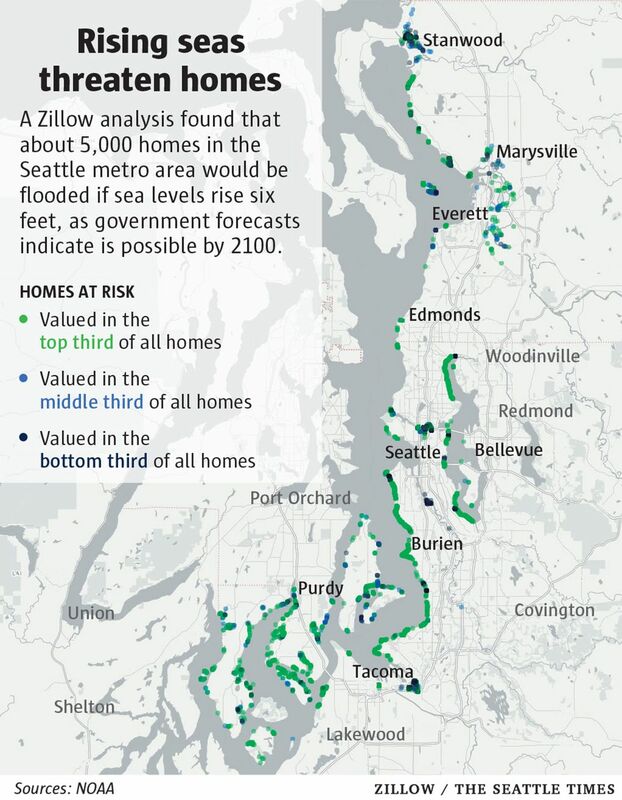 A new Zillow analysis using government climate change forecasts found that about 5,000 homes in the Seattle metro area are in danger of being underwater due to rising seas by 2100. The government sea-level rise report published in June was drafted to be the authoritative analysis of climate change impacts on the United States, and was written by scientists at the National Oceanic and Atmospheric Administration, NASA, and various universities and government agencies. When Zillow mapped out what would happen if Puget Sound-area waters rose six feet, it found 5,042 homes across King, Snohomish and Pierce counties that would be destroyed if not moved or raised. That’s about 1 in every 200 homes in the region. The impact here would be much smaller than in places along the East Coast — under the same sea level-rise scenario, nearly a quarter of homes would be flooded in Miami, and more than half would be underwater in Upper Township, N.J.
Our hilly topography and low density along the waterfront help limit the potential damage here. Locally, nearly 1,600 homes are threatened in the city of Seattle, or 0.8 percent of homes in the city. Another 500 are in danger in Stanwood, 430 in Gig Harbor, about 250 in both Tacoma and Marysville, and about 220 in both Burien and Vashon. Between 100 and 200 homes could flood in University Place, Kenmore, Fox Island, Fife and Des Moines. In Seattle, the waterfront homes in danger are, as you might expect, especially pricey — they have a median value of just under $1 million, compared to the citywide price that’s closer to $700,000. West Seattle would be hardest hit: homes along virtually its entire western waterfront would be in danger of flooding. Lots of homes would also be threatened along the lakefront north of Magnuson Park and near Rainier Valley, and also in the Eastlake neighborhood (that doesn’t include Lake Union houseboats, which presumably could rise with the waters). The Zillow analysis doesn’t take into account whether the Ballard Locks could ensure Lake Washington’s level doesn’t rise along with the level of Puget Sound. In the suburbs, as in Seattle, a majority of the homes in danger are on the pricey end of the spectrum — in Burien, for instance, the median endangered home is worth $1.1 million, more than double the citywide price. Those owners of ritzier homes would presumably have more resources to shore up, insure or move their house. But in Fife, Kenmore and Stanwood, most of the homes in danger carry some of the lowest home values in those cities and are more likely to be owned by lower-income residents. Altogether, the homes threatened by rising seas have a combined value of $2.2 billion in the city of Seattle, and $4.7 billion across the metro area. Statewide, about 27,300 homes could be flooded, including 7,300 in Grays Harbor County, or 21 percent of homes there. About 4,100 homes are threatened in Whatcom County (nearly 5 percent of homes there) and 3,000 in Island County (8 percent of homes). One caveat: The government science report predicts that sea levels may rise more slowly across the Pacific Northwest than in other parts of the country, and that’s not accounted for in Zillow’s analysis. This story has been updated to clarify that the analysis does not take into account whether the Ballard Locks might protect Lake Washington.